Have you seen Rusty Rivets yet? It’s a great series and it’s from the makers of PAW Patrol, Season 2 is about to premiere on Nick Jr. UK so it’s worth checking it out. Here’s a clip for you to have a look at. When there’s a job to do and stakes are high, ten-year-old Rusty Rivets – along with best bud Ruby – invents his way out of every jam by repurposing parts and objects into the wildest, coolest most awesome contraptions ever. It’s just the show for any aspiring engineers out there. I’ve teamed up with Nick Jr.UK to celebrate the season two premieres from Monday 9th April at 4.30pm. I am offering a fabulous Rivet Lab Playset worth £44.99 RRP for one lucky reader to win in a promotional giveaway. Enter via the Gleam widget below. 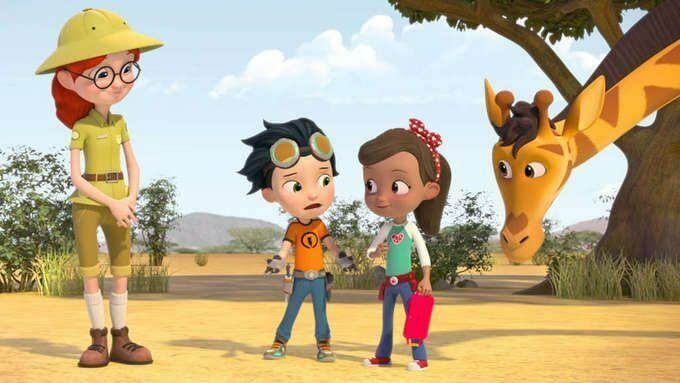 Don’t forget to tune in at 4.30pm to see the latest Rusty Rivets episodes. This giveaway is open to residents of the UK only. Entrants must be 18 or over at time of entry. The winner will receive one Rusty Rivets Rivet Lab Playset worth £44.99. There is no cash alternative to the prize stated, the prize is not transferable and no part or parts of the prize may be substituted for other benefits, items or additions. The giveaway will open on 9 April 2018 and close on 23 April 2018 at midnight. The winner will be drawn at random within 24 hours of the giveaway ending and notified by email. If the prize is not claimed within 28 days, another winner will be chosen. Nine to Three Thirty accepts no responsibility for the delivery of this prize. Great prize for the children. Lots of fun. Fabulous giveaway. My niece would love this. I love the repurposing aspect of the show, great example to set to the kids! My son loves Rusty Rivets, he would love this. Thank you for the review and giveaway. My grandson would love this, Thanks for the chance. What a fantastic giveaway! My little nephew would love to play with this when he comes to visit! Thanks for the chance, my son loves rusty rivets. Great playset to keep them busy! Love the look of the Lab Playset and another great Rusty Rivet toy. What a super prize – my grandson would love it.